I did an experiment! Above are two swatches. The one with the tag is what I ship when someone places an order. The other one is smaller, unlabeled, and has a black Sharpie dot in the corner. The one with a black dot was soaked in cold water as part of my experiment. I'll get to that in a moment. Since the yarns are not dyed, the colors do not fade in the wash. The colors actually become deeper with each warm water washing, especially in alkaline water, until they reach their full potential. The absence of dye may make the fabric good for babies and others with sensitive skin. The color deepening effect is a fun property for anyone to play with. Though I've observed subtle color deepening when I first began knitting the yarn and washing the swatches in warm water, I hadn't done a controlled experiment until now. The fabric is washed in cold water and tumble dried at the knitting mill as part of the production process. Cold water does not seem to have an effect on color. Tumbling in a hot dryer doesn't seem to have an effect either. 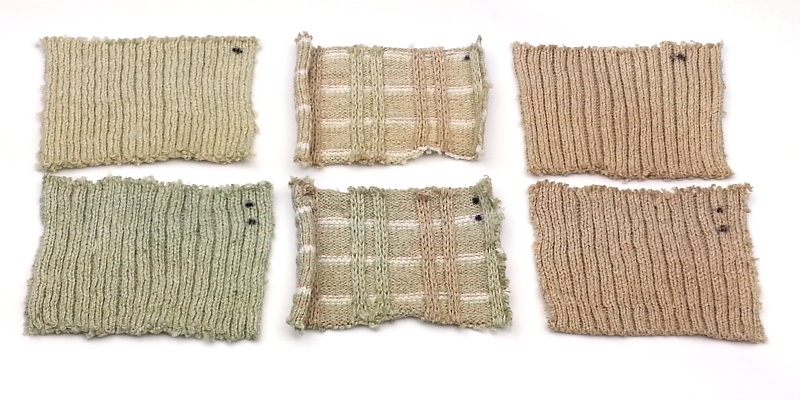 For my experiment I worked Mesa Plaid fabric, the solid color grown light green ribbing, and color grown tan ribbing. 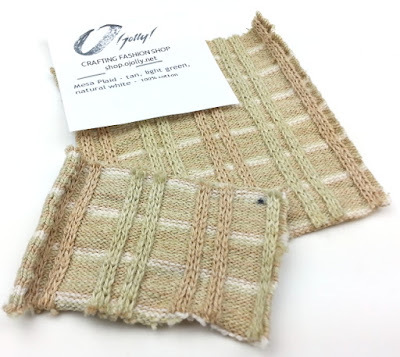 Each swatch was cut into two pieces. The pieces with the single black dots received a cold tap water soak for 15 minutes and were allowed to air dry. The pieces with two dots were soaked in a bath of 2 teaspoons of baking soda dissolved in 5 cups warm (comfortable for my hands) water for 15 minutes and also air dried. Here are the results. Hoping to get consistent lighting as my experiment continues, I've used artificial lighting for this photo. The deepening of the color is more apparent in the light green yarns. The deepening is present in the tan too, though I'm not sure the difference is captured in the photo. I don't know what the "full potential" shades of the fabrics are, but I'll continue to soak the three bottom swatches from time to time to see what happens. This experiment is fascinating. Already the plain green rib has taken on a life of its own after the warm water soaking. Can't wait to see if it deepens further.